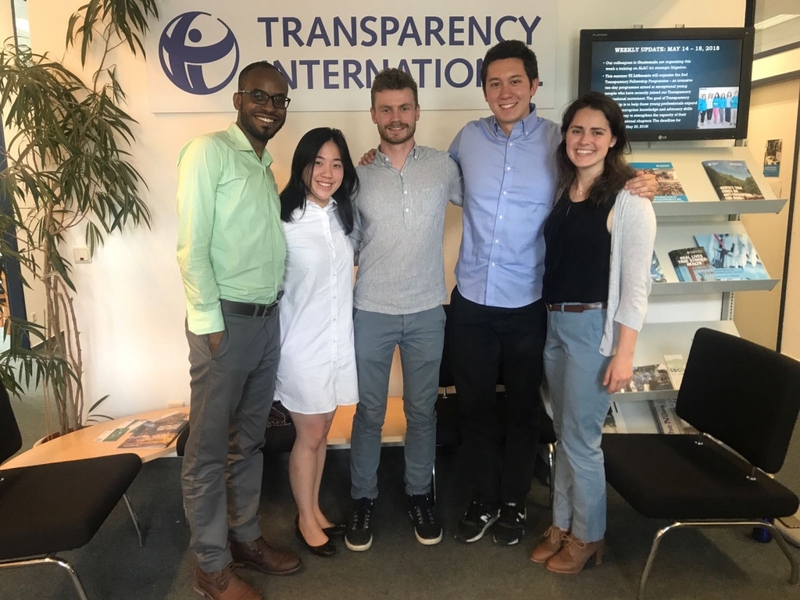 Jovan Johnson, Khai Leang Yeap, Sebastien Feron and Alyssa Bryan provide a summary of a student consulting project recently published by Transparency International (TI), arguably the world’s main civil society coalition leading the fight against corruption. The group of four students were tasked, as part of the MSc Development Management programme, with researching corruption risks faced by development finance institutions (DFIs) involved in blended finance. After eight months of work including interviews with more than 30 experts and institutions such as the World Bank, Organisation for Economic Co-operation and Development, European Investment Bank, a 10,000-word report was submitted to the LSE/TI. Noting the depth of the research in an understudied area, Transparency International commissioned the group to transform the report into a working paper, which it published in December 2018. Throughout the process, many of the experts and DFIs expressed interest in the findings of the research, agreeing with TI that the work could help to trigger further studies, and action, especially given the growing emphasis on blended finance instruments filling the financing gap if sustainable development goals are to be achieved. LSE MSc Development Management (2017/2018) students at Transparency International headquarters in Berlin, Germany in May 2018 for the presentation of their findings on research in blended finance and corruption risks to development finance institutions. From left: Jovan Johnson; Khai Leang Yeap; Matthew Jenkins, Knowledge and Research Coordinator at Transparency International; Sebastien Feron and Alyssa Bryan. As available resources for official development assistance have come under strain in the past ten years, blended finance has been lauded to finance development in low- and middle-income countries. Governments and international organisations are increasingly advocating for blended finance to fill the ‘financing gap’ between current commitments and target levels of investment needed to achieve the Sustainable Development Goals (SDGs). Advocates of blending contend that relatively small amounts of public resources can mobilise untapped sources of private capital using innovative financial instruments that reduce perceived investment risk for the private sector. However, corruption risks in blended finance projects are understudied and poorly appreciated by many development practitioners, investors, and regulators. As blended finance becomes an increasingly common instrument in development assistance, a richer understanding of the cause and impact of corrupt practices in this form of aid is essential. Transparency International’s new working paper, “Better Blending: Making the Case for Transparency & Accountability in Blended Finance” was in part the product of a consultancy project for LSEID’s Development Management program. The paper finds that, amid the fervour for increased blending, little consideration has been given to corruption risks in blended finance mechanisms. The paper examined the various stages (Project financing, mediation, design, and implementation) of the blended finance project cycle and uncovers several areas where such integrity risks could arise. Indeed, while blended finance can crowd in private capital, it potentially does so at the expense of transparency and results-oriented development outcomes. Increasing transparency and accountability can reduce potential losses due to corruption and improve development outcomes for recipient governments and beneficiaries. The report recommends four key areas in which to embed increased transparency: 1) financing and procurement; 2) due diligence processes; 3) grievance mechanisms; and 4) broad-based accountability. First, the report recommends that procurement processes be conducted in a fair and transparent manner, with clear grievance procedures in place and disclosure of beneficial ownership information and use of offshore financial centres. Given that blended private projects often crowd in non-traditional capital to the development space (e.g., pension funds. ), it is in the best interest of all parties to ensure clear line of sight when partaking in a transaction. In addition, greater clarity should be provided in reports on project-level information, including environmental and social impact assessments, ex-ante and ex-post evaluations, and management of incidences of corruption that may arise throughout the process to facilitate better fulfilment of investors’ fiduciary duties. Second, due diligence processes should be brought in line with international best practice, notably that of the International Finance Corporation. One way to ease this friction is to create spaces for greater information exchange, especially between multilateral development banks and bilateral Development Finance Institutions (DFIs). To date, while multilaterals regularly engage in both formal and informal information sharing activities, bilateral DFIs have less contact with their counterparts, resulting in less opportunities to harmonize standards and learn from one another. When different institutions use different standards, companies may take advantage of this discrepancy to disclose less information than they might otherwise. Independent complaints or grievance mechanisms are another tool which, if done well, could increase transparency and improve outcomes in projects financed through blending. The reality is that grievance mechanisms are rarely productively embedded in development projects today. However, development finance institutions are well positioned to import and enhance their existing grievance mechanisms by leveraging private capital for the projects themselves and using grant money to develop a sound grievance mechanism alongside the project. Development finance institutions are, at their core, banks – as are several of the new institutional investors entering the development space. Thus, most investors in a blended finance project are investing for the sake of a concessional or commercial return. Given this landscape, transparency in financing, due diligence, and evaluation can be the difference between tremendous development impact alongside commercial returns or minimal impact at a breakeven for investors. Ultimately, blended finance provides an innovative and potentially catalytic set of tools which could crowd-in trillions from the private sector to help attain the SDGs. However, research indicates too many questions are still unanswered with respect to blended finances’ impact on development outcomes and its vulnerabilities to corruption and integrity risks. This report is a starting point to enhance transparency and accountability in blending, especially regarding the role of development finance institutions as project mediators. Creating more transparent and accountable integrity management systems in DFIs can encourage more, and better, private capital for the development of low and middle-income countries. These management systems can instil confidence not just in donors, recipient governments, and civil society organisations, but to private investors as well. Alyssa Bryan has returned to the US where she is working in business. Sebastien, a French National, is now living and working in Tokyo, Japan; Charis is beginning a PhD programme in Malaysia in the spring and Jovan works with the European Union in his home country of Jamaica. All four graduated in December 2018 from the LSE ID MSc Development Management programme.